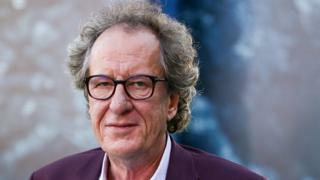 Actor Geoffrey Rush has filed a defamation lawsuit against an Australian newspaper for publishing what he called false and "spurious" allegations against him. He said Sydney's Daily Telegraph caused irreparable damage to his reputation after publishing an accusation of "inappropriate behaviour". He has strongly denied any wrongdoing. The newspaper said it had "accurately reported" a complaint made to a theatre company, and would defend itself. Mr Rush, 66, filed the lawsuit in the Federal Court of Australia on Friday. "It is an action I am taking in order to redress the slurs, innuendo and hyperbole they have created around my standing in the entertainment industry and greater community," he said at a press conference. Mr Rush said the newspaper, published by News Corp Australia, had "splashed spurious claims with bombastic titles on their front page". On 30 November, the Daily Telegraph published a report alleging Mr Rush had been accused of behaving inappropriately during a Sydney Theatre Company production of King Lear in 2015. The allegation was not detailed. The Oscar winner has previously said he had not been informed of the existence or nature of any complaint. Daily Telegraph editor Chris Dore said the newspaper would defend itself in court. "The Daily Telegraph accurately reported the Sydney Theatre Company received a complaint alleging that Mr Geoffrey Rush had engaged in inappropriate behaviour," he said. Mr Rush is one of Australia's most celebrated actors, having starred in films including Shine, Elizabeth and The King's Speech. He stepped down as president of the Australian Academy of Cinema and Television Arts last week, saying he did not want his colleagues to be associated with the allegations.